If you have pets like cats or dogs that go outside at all, you have likely encountered fleas. They are very small, brown bugs that use their tiny claws to attach to your pet (or even to you). 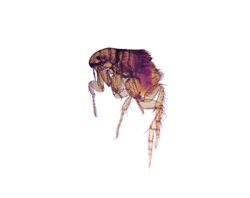 Flea bites itch, and where there is one bite, there are usually a cluster. Fleas can transmit disease to you and your pets, and they multiply rapidly, so if you discover that you have a flea problem, you should handle it quickly. Eco Tech serves the entire Twin Cities metro area and can completely eradicate a flea problem in your home or on your property. Fleas are external parasites, so they actually live off of the blood of mammals. There are 2000 species of fleas in the world, and the most common type is called the cat flea, even though it affects both cats and dogs. To completely treat a flea problem in and around your property, you must treat the affected area in your home as well as your entire yard. Often, fleas can actually infest your yard, and each time your cat or dog comes inside, they bring them in. Soon, your home can get infested and your pets, children (and adults) begin to notice multiple bites. Eco Tech will aggressively treat your entire home and yard and will quickly and effectively reduce the number of fleas on your property. Our flea treatments also prevent more fleas from reproducing, eliminating the flea problem once and for all. Eco Tech also uses a less toxic organic product line, so it is safe for your pets and your children. This means that you won’t have to worry about any residual effects after we have eliminated fleas from your home. Eco Tech has become a leading pest control company in the Twin Cities, MN area with more than 15 years of experience. We have earned a reputation for providing superior customer service and stand behind all of our work with a satisfaction guarantee. Our team does not require contracts unless absolutely necessary, so you can be confident that you will not pay for services that you do not need. Our pest control technicians are professional, punctual, and communicate clearly about issues that they find and recommendations to handle all pest problems. For more information or to schedule an appointment, call (763) 785-1414 or call our emergency line at (612) 237-8282 for help 24/7!